Click on any of the dolls on this link to see the details! 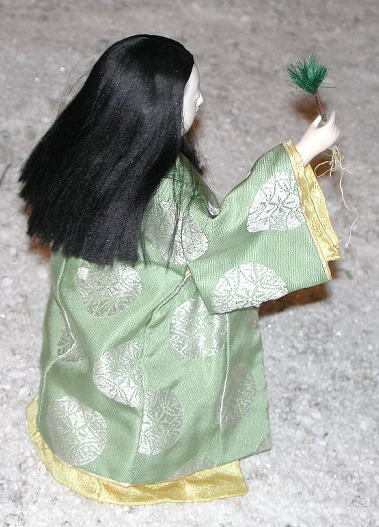 On the first day of the rat, people used to go to the fields and pull out the first herbs and greens (nanakusa, see below), including small pine seedlings with the roots. 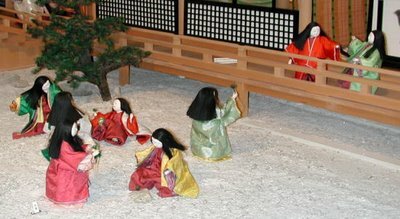 This practise started in the late Nara period and enjoyed by the members of the aristocracy at court. It was a well-loved ceremony and appreas on many paintings, screens and scrolls. Pines, which do not falter during frost and snow, are a symbol for long life. The small pine seedlings were thought to be sepecially auspicious. The sliding door paintings of Reizei Tamechika 令泉為恭 (1823-64) in the temple Daijuji 大樹寺, Okazaki Town, are especially famous. name of a gentle lady in the Tale of Genji. but there is no friend to come with me . 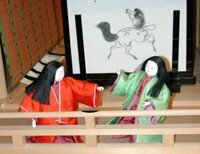 . .
Basho was again in his homeground, Iga Ueno, to spend the New Year. Aristocrats and their ladies were not used to manual labour of any kind. Pulling up a young pine tree on the first day of Rat is a custom that originated in China. Shinji Ogawa explains that its purpose was to bring good luck or longevity. Here, instead of a pine, someone indiscriminantly uproots a young nettle tree. This hokku is from the tenth month (November) of 1820, when Issa was in and around his hometown. On 10/5 Issa's second son Ishitarō was born, and on 10/16 Issa slipped and fell and discovered he had become temporarily partially paralyzed, so he may have brushed this hokku using only one hand and arm. It seems to be a hokku for the upcoming new year, since it evokes the custom of going out into the woods on the first day of the rat in the new year and pulling up pine saplings, roots and all, which were then taken home and revered as a symbol of longevity, since pines were said, according to a tradition going back to ancient China, to live a thousand years. Issa seems skeptical of this custom, and this hokku looks at it from the point of view of cranes, which were also said by tradition to live a thousand years. Since the headnote says the hokku is written in praise of cranes, the verb in the last line seems to take the cranes as its subject. In the hokku people who have come to the woods to pull up young pines on the first day of the rat no doubt envy the cranes when they see the birds in or below a grown pine nearby or perhaps flying through the sky above, and they hope to emulate the long-lived birds by taking home young pines and displaying them in their homes as prayers for a long life and happiness. The cranes, however, do not seem to return the respect shown by the humans when they catch sight of the impressive birds. According to Issa the cranes seem to regard the humans as intruders. Perhaps they make cries of dismay, or perhaps they look at the humans with hard, cold stares. In any case, Issa senses that they don't seem happy to see these strange humans pulling up young pine trees. Following tradition, Issa may be suggesting that the cranes seem to look down on these out-of-place humans so much that they pity them. They themselves naturally live a thousand years -- a symbol for many, many long bird-years -- but all these poor humans can do is crudely imitate cranes by pulling up young pines, thereby ensuring that the saplings never live live to anything like their full lifespan. Issa's suggestion seems to be that humans should stop harming pines and other natural objects and instead learn how to live naturally long lives the way cranes do. Soon after this hokku in Issa's diary are placed two hokku that are evidently prayers for the vigorous growth of Issa's second son Ishitarō, so the above hokku may also indirectly express Issa's hope that his second son will grow up to be a naturally strong person who will lead a spontaneously long, healthy life like a crane. Unfortunately Issa's second son died in the first month of the next year. Samisu is an old verb with the modern equivalent, anadoru: to despise, to hold in contempt; Kogo dai jiten (Shogakukan 1983) 719. Pulling up a young pine tree on the first day of Rat is a custom that originated in China. Shinji Ogawa explains that its purpose was to bring good luck or longevity. In this haiku, So^ba is a place name, not soba (buckwheat noodles). My translation is a bit free. Literally, according to Shinji, Issa ends the haiku with the statement, "it must be the pine." I imagine that someone is choosing a young pine to uproot.